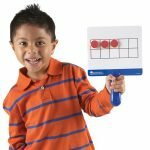 Reinforce counting, 1-to-1 correspondence, base ten, addition and subtraction, operations, and more. 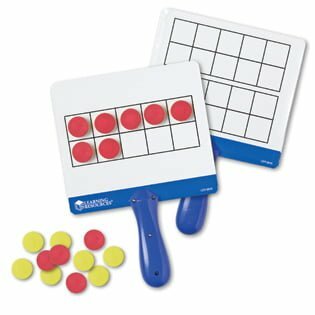 Students position magnetic counters, then raise boards to show their answers. Magnetic, write & wipe boards feature ten-frame on one side, double ten-frame on the reverse. Includes 4 boards, 100 double-sided, foam magnetic counters (red and yellow), and Activity Guide. Boards measure 7″L x 6¼”H.